Next on our journey, after spending time in reflection and paying attention to our dreams, we come to 19-The Sun rising and shining brightly. The Sun represents joy, warmth, and trust. We are back in the light; balanced with our darker, moon side. The Sun also represents epiphanies and Aha! moments. The sun lets us know that there is no need to worry about hidden agendas or motivations. We are all about trust and those we work with can also be trusted. As long as we stay positive we can manifest anything we want; we will be successful. A child is shown on the Rider (RW) tarot because children trust everyone. You see that the child is naked showing us that there is nothing to hide. 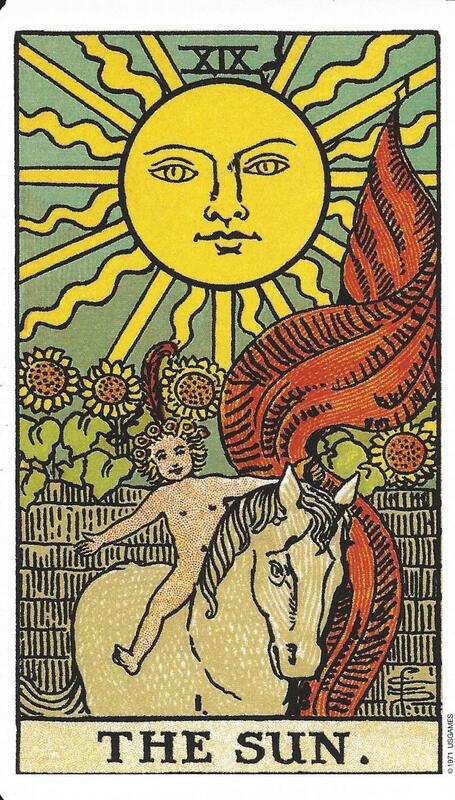 In the RW tarot, the child is holding an orange standard (flag or banner). Orange signifies the merging of conscious and unconscious. In both cards, there is a wall representing humankind’s ability to adapt. We have moved from our intuitive side protected by the wall, out into the open to share with humanity. The four sunflowers represent the four suits of the minor arcana and the four elements of fire, water, air, and earth. The butterflies in Angel tarot fluttering about represent growth and evolution. This card can reflect the fact that self-confidence for you either has grown or is growing by leaps and bounds. Everything you have done to this point has led you to a more relaxed and balanced time. You can be playful and take the free-and-easy approach. Keep your thoughts positive. You are on the right path headed toward enlightenment. 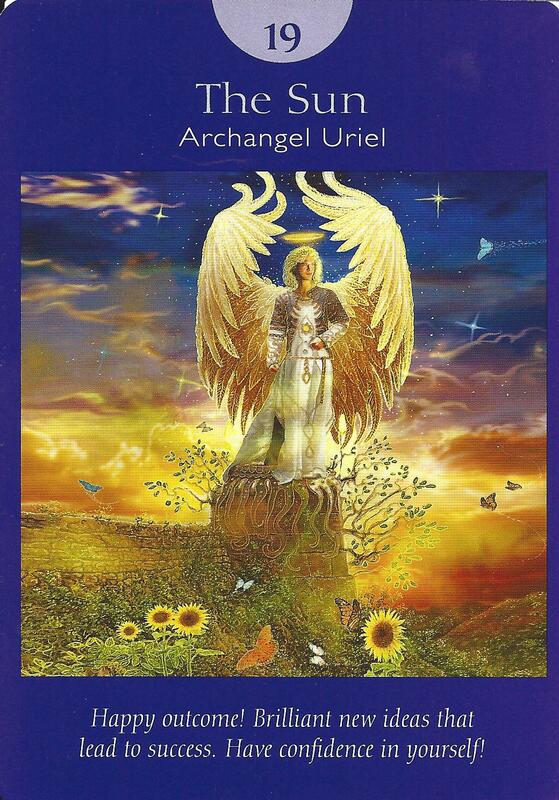 Archangel Uriel helps us with mental functioning, which can include focus and concentration. If you are lacking confidence call on him to help you to have more confidence and wisdom.